Run long enough and bad runs are bound to surface. They’re certainly not subtle when they do. Last Saturday I had one of the worst runs of this training cycle, thus far. My schedule called for 20 miles; I could barely make it five. Uncooperative legs, riddled with aches and pains, refused to loosen up. My mind wasn’t fully present and prepared to tackle a long run. It’s one of a handful of times I had to quit early. This time, not by a mile or so, but by 15! I walked home nearly in tears – disappointed, deflated, angry. As demoralizing as the run was, I knew it wasn’t due to lack of ability. I’d run 20 miles two weeks prior without issue; and I ran 18 miles the previous weekend feeling great. Perhaps it was the result of cumulative factors; maybe it was more in my head than anything. Whatever the reason, I knew I’d attempt long run number two the following morning. I always allow myself a degree of flexibility in training. Not every training run needs to be spot-on. Workouts get shifted around; pace isn’t always where it needs to be. Usually, I’m content knowing I do my best given the circumstances of the day or week. However, the long runs are the cornerstone of my training. I need them not only to build endurance, but to train my brain. It’s one thing on which I’m working diligently – building confidence to make my race day push. Until November, the closest conditions to race day I get are these long runs. Originally I told myself I’d run 15 miles on Sunday. Combine those with the junky five from the previous day to total 20 miles. Done. I can manage 15 miles. I would still hit my weekly mileage goal in the end. In reality, I knew a full do-over was in the works. My thoughts were churning. I wanted to make amends and run all 20 miles in one shot. It was a matter of restoring conviction. Saturday evening, I was in Brooklyn for dinner. Walking, I noticed graffiti (always catches my eye) in a lovely script. 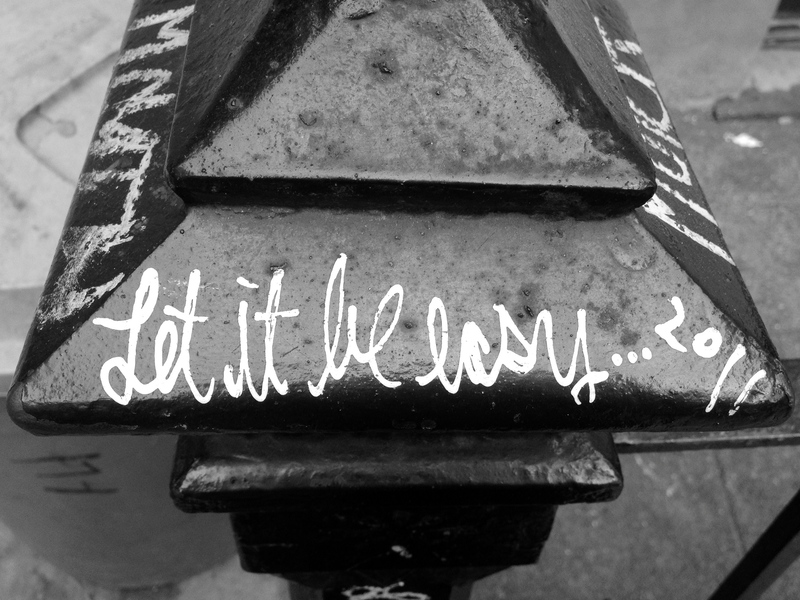 The striking white letters on a black post read, “Let it be easy.” I snapped a photo and let the words take root in my brain. Later that night, I did an Epsom salt soak for my legs. Foam rolling unearthed an alarming amount of trigger points in my calves and quads. My legs felt pulverized by the time I went to sleep. The next morning, my legs were comfortable and ready to run. My brain was also anticipating redemption. I was ready to have a go at those 20 miles. I set out for one of the best runs I’ve had recently! My body felt comfortable the entire workout. I kept my form relaxed, my mind easy. At no point during the run did I have doubts about making the full distance. Everything fell into place and it felt amazing. Looking back, maybe I paced a bit too fast compared to plan. But it was the result of just letting go, enjoying the moment, and letting the miles roll under my feet. It’s a feeling I hope to have on marathon day. As I traveled the city by foot that morning – with views of the water, skyline, and bridges as backdrop – I thought, “let it be easy.” Not that there weren’t moments I needed to push, or harden my resolve. It was more a matter of accepting the moment and being present. There was no struggle – no coercing my body – just a peaceful run that reestablished belief in myself and my training. This weekend I learned the bad workouts are just as important as the good. They’re opportunity in disguise. Nothing fuels the fire better than realizing we have a choice to give in or push back. I needed that. I’d rather a detestable training run, with the chance to rectify, than a bad race experience. In training, as in life, the bad days don’t last. Never doubt the difference a day can make. running is so mental. such a great mantra for a 20 miler! glad you got it round 2! Definitely, Kristy! That’s why I was so hesitant to just let the 20-miler go. I really need that mental training and I didn’t want to miss the opportunity. Thanks! Pingback: See Sean Run » Blog Archive » Dude, I totally got chicked by @EmilyRSutton…..three times!